Calicium lenticulare (A-C) and C. hyperelloides (D-F). These two calicioid lichens grow on bark and lignum, and are widely distributed in Japan. / For details, see the article by Kusama et al. 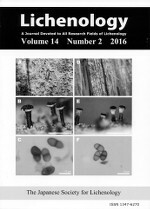 in this issue [Lichenology 14(2): 153-158].